A bright and promising military career has been prematurely closed by the death in action of Sergt. Joe Walker, a Military Medalist, son of Mr and Mrs Robert Walker, Norwood, Killamarsh. The sad news following so closely upon the death of Pte. W Drackett, has caused something of a shock in the village, for although only quite a young man the gallant sergeant was a popular but unassuming fellow, and no family is held in higher esteem than the deceased's parents. The intimation that Sergt. Walker had been killed came to hand this week, when Mr Walker received the following letter from his son's pal - Sergt. C Shaw of the York and Lancs. He wrote:- "I must now take the opportunity of writing to you the sad news in reference to your son's death - Sergt. J. Walker, of the Yorks and Lancs. I am very sorry to say that he met his death on the morning of the 18th, about 6.15, while carrying out his usual heroic duties, which every one of us admire. He was in my platoon and my chum out here, and all the platoon, including myself feel the loss of such a brave and gallant N.C.O., and his comradeship in our company. No better N.C.O. have I worked with. We could depend that any duties he carried out were done with a good heart. We brouht his body into our trenches and the officer held a service. He was buried at ----, where we erected a cross." From sentences in the foregoing letter it is clearly indicated that in the opinion of his fellow men Sergt. Walker has throughout the war - and he has seen much fighting - comported himself with bravery and credit. His career in the Army has been a praiseworthy and interesting one. He joined the Yorks and Lancs on August 29th 1914, and went across for the first time after having about 12 months' training. Quite early on he gained his first stripe, and in October 1916 he was made Coporal. In December 1916 he was awarded the Military Medal, and the official record of the deed which won him the honour states:- "For gallentry and devotion to duty on the morning of December 3rd 1916, near ---, during a raid on the enemy trenches. Corporal Walker led his bombing party with great dash down the enemy trenches, and when the order was given to return to our trenches he covered the retirement by throwing bombs. He showed considerable resourcefulness and bravery during the raid". He was home for short leave at Christmas of that year, and it was not long after his return to the Front that he again distinguished himself by saving the life of an officer - Lieut. Popplewell, whose home is at Harpenden - by carrying him to safety under artillery fire. Writing to his father uner the date June 9th, Sergt. Walker mentioned that he had received a letter from the officer's mother. Walker added "He was a gentleman to everyone in this company...you do things when it's hell on earth, and you think no more about it when you have done it. Surely a man with any heart at all could not leave another man to the mercy of the hell out in 'No Man's Land'. The officer's mother wrote to the Sergeant thanking him for "the great thing he did for them in saving her son's life at the risk of his own", and adding no words or anything they could do adequately expressed what they felt. Explaining what Sergt. Walker did, Mrs Popplewell, in a letter to Mr and Mrs Walker, under date July 14th 1917, says: "Perhaps you have not heard from your son what he did at the battle of Messines. My son was severely wounded when close to the objective and your son carried him all the way back on his back. It was a spendid and brave thing to do and undoubtably saved my son's life. I am prouder of it and more thankful than I should be if he had won the VC which your son deserves, because it proved his men love him." Before performing this act Joe Walker had been made Lance-Sergeant on April 17th 1917, and two days later he was made Sergeant. Before the war, Sergeant Walker was chiefly interested in music and was a member of the Killamarsh Orchestral Society. Much sympathy will be felt for Mr and Mrs Walker in their loss. The sergeant's uncle, Mr T.M. Walker, is a respected member of the Killamarsh Parish Council. Joseph is commemorated on the Kiveton Park Colliery memorial. 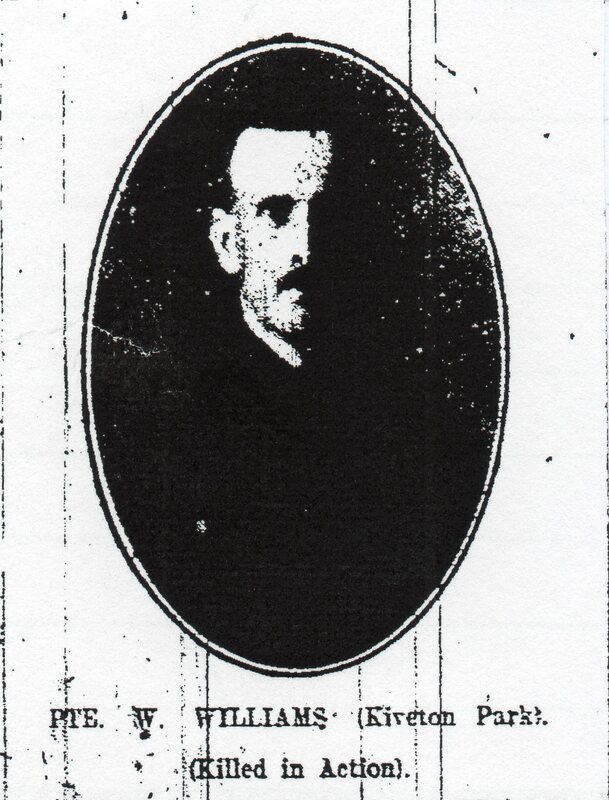 Private Bruce Walshaw was born in 1888 at Penistone, the son of Job and Emma Walshaw and the family lived at Hardwick Lane Farm, Aston where Bruce helped in the family business. He enlisted at Swallownest into the King’s Own Yorkshire Light Infantry (KOLYI), 1st Battalion (20630) but was killed on 8th May 1915. He is commemorated on the Wales UM chapel plaque. 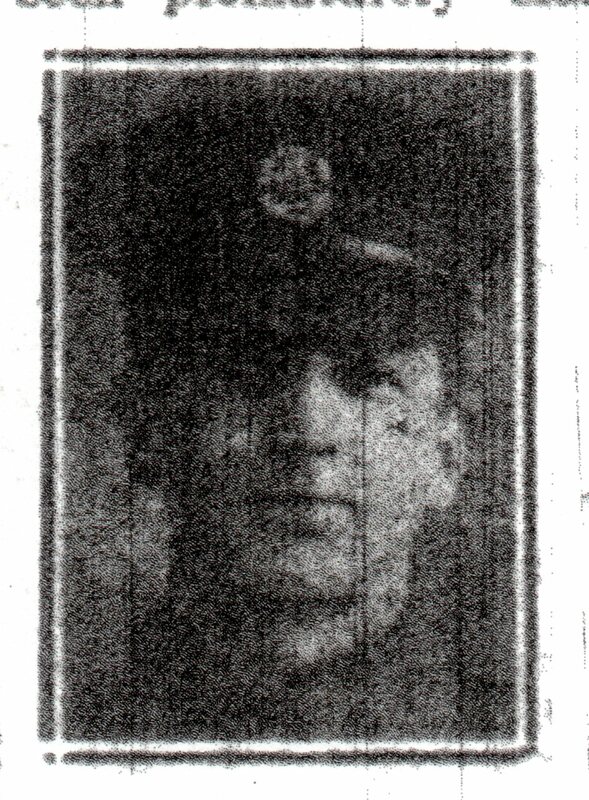 Although not commemorated in Wales or Kiveton, his brother Colin also died 1919. Nothing has been heard of Pte. Geo. Wapplington of the 2nd Batt. Coldstream Guards since December 22nd last. Application has been made to the War Office a considerable time since for information as to whether he has been killed, wounded, or taken prisoner, but the authorities have not been able to find any trace of him. He is on the ‘missing’ list. The parents are passing through a very anxious time, but are hopeful if any of our wounded soldiers of the Coldstreams who have seen or heard of him would get in touch with them it would help to relieve their anxiety. It was not until 14 months after he went missing that his death was confirmed. He is remembered on the Le Touret memorial in France, and also the Kiveton Park Colliery Memorial. 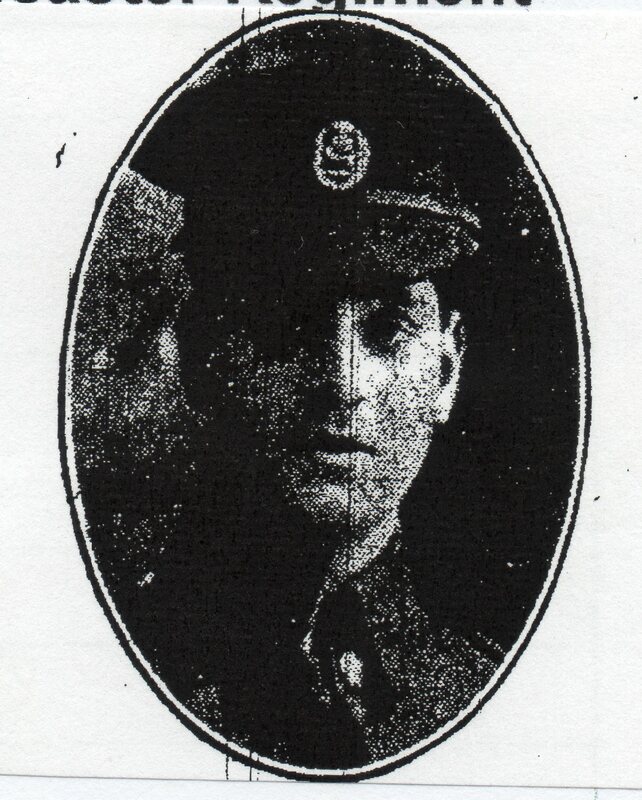 Private Joseph Waplington (b.1887 at Claycross) was the elder brother to George and had previously served as a soldier. He was a reservist at the time of the outbreak of war and was recalled to his regiment, the Coldstream Guards (6173). He was wounded in the leg. Private Reginald Watson was born in 1898 and called up on 17th May 1918 at Derby to join the Leicester Regiment, 4th Reserve Battalion (58498). He left Somercoats on 17th September 1918 for France with the Leicester’s, 1st Battalion, 71st Brigade, 6th Division, D company. He was wounded 8th October and sent to Lincoln 4th General Hospital. He was discharged on December 27th 1918. An A Webster appears on the Wales UM chapel plaque but we have been unable to ascertain who this relates to or any further details. If you can help, please get in touch. 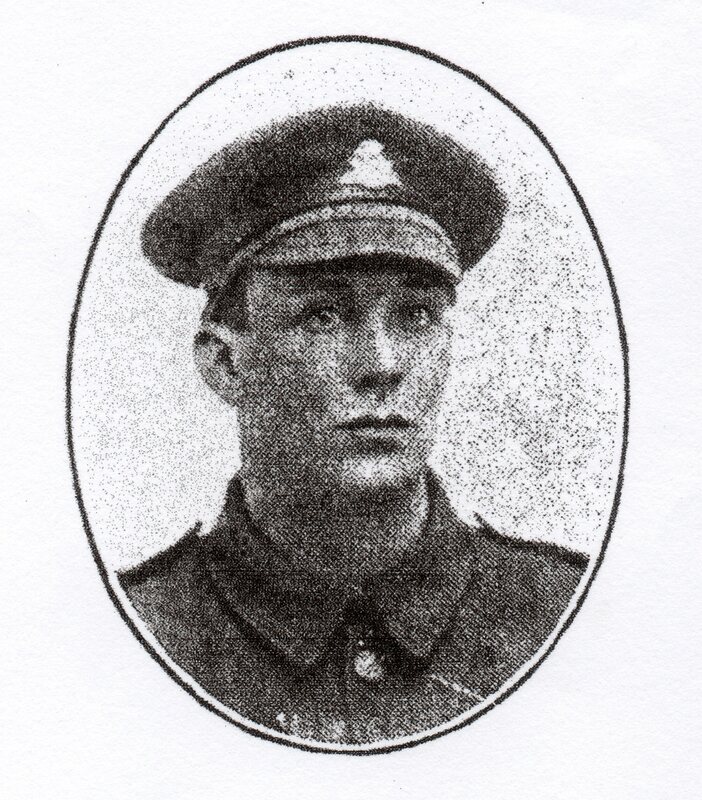 Private William Weston (b. 1897 at Firvale, Harthill) served with the East Yorkshire Regiment (52207). He worked at Kiveton Park Colliery and married Annie Parker in February 1917. 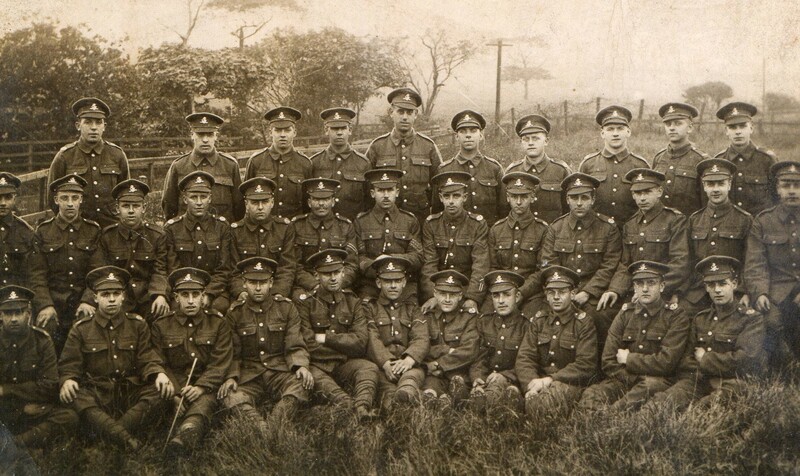 He is pictured here with his Company on the back row, 4th from left. The funeral of Lance-Corporal John Robert Whyles, son of Mr. and Mrs. R. Whyles, Wesley Road, Kiveton Park, which took place on Monday afternoon, was marked by very impressive scenes. The deceased, who was 28 years of age, enlisted early in the war, and saw considerable active service with the Duke of Wellington’s (West Riding Regiment). He was wounded in 1916 and returned to France on recovery, and on Easter Sunday, April 9th 1917, was reported killed by the War Office. A memorial service was afterwards held at St. John’s Church, Wales. Some weeks later his parents received the welcome intelligence from Whyles himself, that he was alive, but a prisoner of war in Germany. He had been severely wounded on April 9th in an attack near Arras, and lay out between the line for five hours, during which time he was again wounded in the legs by machine gun fire and rifle grenades. He was afterward picked up by the Germans and taken to Donai, where he was operated upon and afterwards went to a hospital at Amoux, in Germany. Owing to lack of attention, the wounds in his left leg became worse and induced a high fever and on May 22nd 1917, it was found necessary to amputate the left leg, as the only means of saving his life. After considerable hardships in Germany, he was repatriated in company with other disabled soldiers, landing in England on January 17th 1918. After some period in hospital he was found light employment at the Kiveton Park Collieries, where he worked previous to enlistment. His sufferings in Germany however, had undermined his health and some few weeks ago he became seriously ill and was eventually sent to Wharncliffe War Hospital where he stayed about a fortnight and was sent home as incurable. He passed away yesterday week the cause of death being certified as tuberculosis and heart disease. Before the war he was a fine big healthy man and there is no doubt that his death was caused by his sufferings in the hands of Germans. About two years ago, he married Mrs. Grace Easy who had lost her husband in action and had been left with four small children and much sympathy is expressed with her in her second tragic bereavement, which leaves her with an additional child. The principal mourners were Mrs. J. Whyles, widow, John, William and Grace Lilian Easy; Mr. and Mrs. R. Whyles, parents; Mr. and Mrs. L. Shaw, brother-in-law and sister; Lucy, Lily, Hetty, Katie and Charles, sisters and brothers; Mrs. Walker, Mansfield, sister-in-law; Mr. J. Whyles, Garthorpe; Mr. and Mrs. W. Woodhead, uncle and aunt; Mr. and Mrs. J. Woodhead, uncle and aunt; Mrs. Cooper, aunt; Mrs. Child, aunt, Mr. and Mrs. F. Whyles, cousins and others. In addition to the many family floral tributes, wreaths etc. were sent by Miss. Louder; Mr. and Mrs. J. Louder; Mr. and Mrs. C. J. Leather, Sheffield, “in memory of a brave soldier”; Mr. and Mrs. Holland; Wales Conservative Club; The West Riding Local War Pensions Committee; and the Discharged Soldiers. Much sympathy is felt with the parents and family of the deceased in their bereavement, especially as the younger son had already paid the supreme sacrifice, Lanc-Cpl. F. Whyles, K.O.Y.L.I. being killed at Friecourt on July 1st 1916. Mr. R. Whyles, the father, had been a confirmed invalid for several years. The arrangements for the military side of the funeral were made by Messrs. W. Wigmore and W. Blackwell and it is understood that the expenses on that account will be met by the ex-servicemen. Mr. A. Powis had charge of the funeral arrangements. 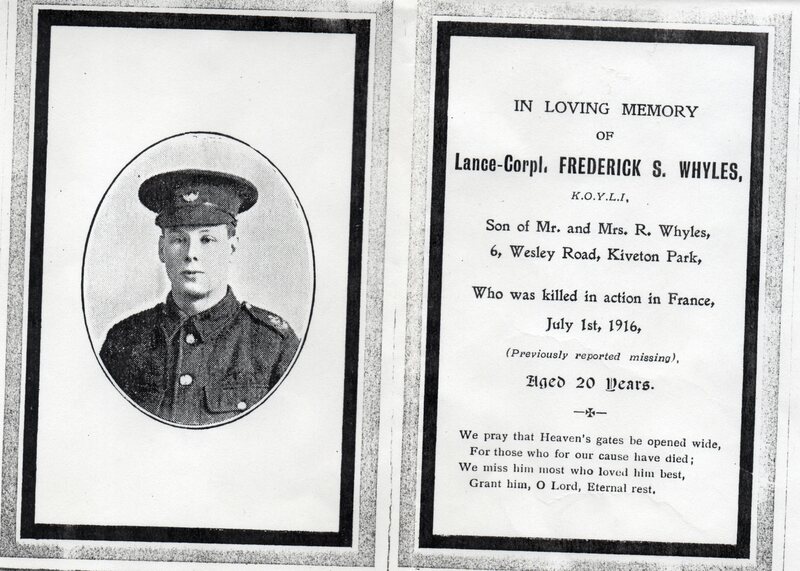 Lance Corporal Frederick Samuel Whyles (b.1896, Wales) was the younger brother of John Robert Whyles. He enlisted on 15th November 1914 into the King’s Own Yorkshire Light Infantry (KOYLI), 8th Battalion, service number 19900. He was killed at Friecourt in the great offensive of 1st July 1916 and is commemorated on the Thiepval Memorial, pier 11c, face 12a; also the Wales Square and Kiveton Colliery memorials. Samuel played football for Kiveton, helping them to win the Davies Charity Cup in 1913/14. Whilst in the army he won several trophies for football and also a medal fro cross country running (from Worksop Guardian December 15th 1916). Private Thornton Whysall was born around 1895 the son of Frank and Sarah Whysall who lived at 32 Wesley Road, Kiveton. He enlisted in September 1914 into the York and Lancaster, Sheffield City Battalion, service number 12/555. Along with so many others, Thornton was killed on 1st July 1916 and is commemorated on the Thiepval Memorial, on Pier and Face 14A and 14B. His name also appears on the Wales Square memorial and as an employee of the Kiveton colliery, the colliery memorial also. A history of Thornton’s experiences has been written by a descendent and we hope to publish it on this site soon. Private Worthy Wigmore was born in Kiveton in 1881. He served with the Coldstream Guards (from December 1899) and saw action during the Boer War in 1902. As a reservist, at the outbreak of the war he re-joined his regiment the Coldstream Guards, 2nd Battalion (service number 3130) in August 1914 in London. On enlistment he was living with his sister and brother in law, Joe and Fanny Osborne at 4 Park Terrace, Kiveton. He was a member of the voluntary fire brigade and after the war was a Publican and later winder at the colliery. Official intimation has been received of the death in action of Private William Williams, 1st Lancashire Fusiliers. Pte. Williams, who was 34 years of age and unmarried was a native of Ashton-in-Makerfield, but had lived for a considerable number of years in Kiveton Park, working at the Kiveton Park Collieries. For the past few years, his home has been with Mr. and Mrs. Holmes of Wales Road, who miss his cheery presence and deeply regret his loss. Pte. Williams enlisted on August 2nd 1915, and after only nine weeks training was despatched with the Expeditionary Force, taking part in the famous Suvla Bay and Cape Helles operations. After the abandonment of the Gallipoli campaign, Pte. Williams went to Egypt, and subsequently to France, where he was called upon to make the greatest sacrifice. He was very popular and well liked at Kiveton. He is remembered on the St John’s Church plaque, Wales Square and Colliery memorials. Private Percy Willis (b.1895, Worksop) was living with G E Spooner at 14 Stanley St Killamarsh and working at Kiveton Park Colliery on the outbreak of war. He served with the York and Lancaster Regiment, 6th Service Battalion (19958). He was killed on 12th September 1916 and is commemorated on the colliery memorial. W Wooton appears on the St John’s Church Roll of Honour but we have been unable to locate further details. If you can help please get in touch. Mrs. Wragg, Albert Terrace, Kiveton Park, received a piece of good news on Monday. Her son, Private W. Wragg, 6th Lincolns, had not been heard of for about three months and communications to the War Office and the officers in charge of the records failed to locate him and Mrs. Wragg had almost come to the conclusion that he had joined the great majority. On Monday, however, Mrs. Wragg received a letter from her son, stating that he was in a rest camp and quite well after the long and strenuous Gallipoli struggle. It appears that the letters of both mother and son had gone astray and Mrs. Wragg was naturally overjoyed to hear of her soldier son’s safety. The Wyatt brothers, John, Henry, Wilfred and Percy were the sons of Henry and Lucy Wyatt of Anston. All 4 of the brothers followed their father’s profession and became tailors. Lieutenant John (Jack) Harold Wyatt was born in 1893 and enlisted early in the war into the Notts and Derby regiment as a Private but was rapidly promoted to Sergeant. He later accepted a commission as a Lieutenant in the Leicestershire Regiment and from the army on 8th May 1920. Gunner Henry Norman Wyatt (b1896, Anston) served with the Royal Garrison Artillery, as did Sergeant Wilfred Fisher Wyatt (b1897). The youngest brother Percy Wyatt was born in 1900. He may have joined and served lat on in the war although we know he was involved in tribunals.